The 48-Hour T-Shirt was a 2008 project in collaboration with Derek Black, Greg Eckler, and Angie Smith (now Angie Moramarco), all of whom were Savannah College of Art and Design students at the time. Each T-shirt cost $18 and was made available for sale for precisely 48 hours. T-shirts were then printed and shipped in precise response to demand. All printing by Derek Black. All profits went to the student designers listed above. Coverage: Core77, PSFK, Design Observer, Coolhunting, and Coudal. 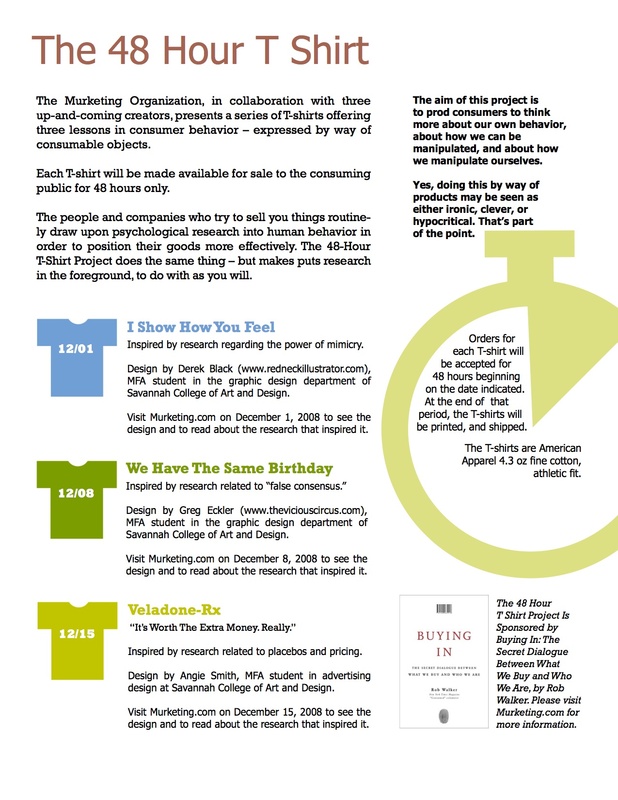 Below, a promotional PDF announcing the project in 2008. NOTE: The project is long over! The T’s are no longer available, and any related email lists you encounter after clicking around below are defunct! 48-Hour T-Shirt No. 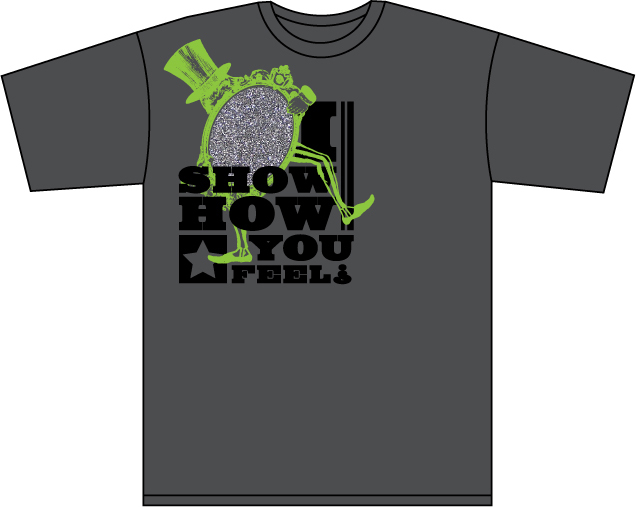 1: “I Show How You Feel”: Three colors (metalic silver ink, black, flourescent green) on a gray American Apparel 4.3-ounce fine cotton athletic fit T. A summary of the research inspiring the design, below, is also available in PDF form, here. This phrase was quoted in a recent paper by scholars researching the subject of mimicry and its role in the day-to-day marketplace. The research was summarized in the April 2008 issue of The Journal of Consumer Research, in an article titled “Of Chameleons and Consumption,” which noted that prior studies suggested “that mimicry serves as an important communication tool, communicating to the person being mimicked that ‘I show how you feel.’” This newer research specifically explored “the effect of mimicry on consumption,” and how it might be used in, for instance, sales techniques. 48-Hour T-Shirt No. 2: “We Have The Same Birthday”: Two colors on a brown American Apparel 4.3-ounce fine cotton athletic fit T.
A summary of the research inspiring the design, below, is also available in PDF form,here. The research involved dividing into two groups; members of each were asked to read an essay about Rasputin, and then asked to evaluate their feelings about him. One group was given an essay that noted Rasputin’s correct birthday. The other was given the identical essay, but the date of his birthday was changed — to be the same day as that of the reader. The latter (same birthday) group evaluated Rasputin notably more favorably than the control group did. 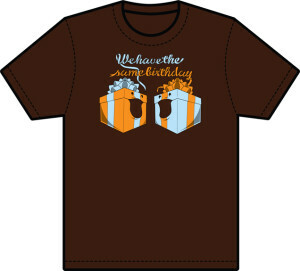 So: Perhaps if you wear this T-shirt, you will make a good impression. Design by Greg Eckler (www.theviciouscircus.com), MFA student in the graphic design department of Savannah College of Art and Design. 48-Hour T-shirt No. 3: Veladone-Rx: White on a red American Apparel 4.3-ounce fine cotton athletic fit T.
Veladone-Rx is a made-up drug name used in an experiment about pricing and the placebo effect. I have a thing for imaginary brands, so I’m particularly excited to offer you the opportunity to advertise this non-existent product drawn directly from — of all places — the world of behavioral psychology studies. This fictional pain-killing drug was part of an experiment conducted by Dan Ariely— the behavioral economics expert and the author of Predictably Irrational — and colleagues. Subjects read a brochure explaining what a great painkiller Veladone is, and that it cost $2.50 a pill. After a dose, almost all subjects experienced less pain (from electric shocks). In reality, Veladone was merely Vitamin C. Here, then, was the placebo effect in action. 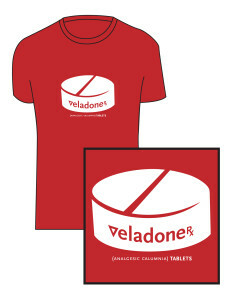 Then the experiment was repeated – this time a group of subjects were told that Veladone cost just 10 cents a pill. Under that circumstance, the result was much less impressive: Only about half the subjects experienced pain relief. The moral, evidently, is that we get what we pay for – even when we’re just paying for a placebo. Design by Angie Smith, MFA student in advertising design at Savannah College of Art and Design.